One of my goals this year is to make a good group of local female friends. Not easy in your 30s in New York. It’s extra challenging as an empath with severe trouble prioritizing myself in any way. After 6 months of putting myself out there continuously, joining groups, playing sports, saying yes to too many social events and stretching myself thin, I’ve made a couple of disjointed, one-sided friendships. I’ve made girlfriends who can’t pass the Bechdel test. Who ask me to analyze every text message she receives from a guy. Intelligent, educated, interesting women. Who interrupt each other’s stories to squeal over a fleeting Tinder romance. Who remember everything a guy said or did or implied or didn’t say, but keep asking to make plans with me for the weekend I’m attending my grandmother’s funeral- which I’ve told her about. More than once. Pulling this card fills me with hope, but it’s also upsetting. I give of myself until I am raw and and bare. I always will because that’s who I am. A friend who can be counted on and keep your secrets and tell you what you need to hear, not what you want to hear. I have incredible friends all over the world who love and admire me for this, among other things. I miss them. But all I want is a group of local women to go to brunch together and make fun of art at the museums or sip Prosecco on rooftops and talk about music and film and sports and- yes- guy problems because there’s nothing wrong with that until it consumes a woman. No more deprioritizing myself just for the sake of company. Quality over quantity. I’m certainly not perfect, but I’m present with people. I deserve as much. 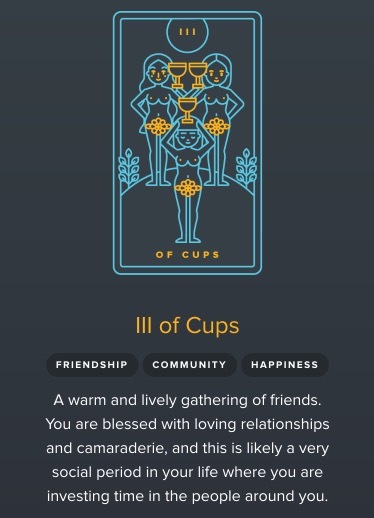 Thanks, Three of Cups. I joined a promising book club today and skeeball season starts again soon. I’ll keep my head up and trust that my tribe is looking for me too. This entry was posted in Carney Life, Tarot and tagged Female Friends, Friendship, Making Friends, Tarot by CarneyVorous. Bookmark the permalink.